In Roman Catholicism, Eastern Orthodoxy, Oriental Orthodoxy, Anglicanism, Lutheranism and some other Christian denominations, a chalice is a standing cup used to hold sacramental wine during the Eucharist (also called the Lord's Supper or Holy Communion). Chalices are often made of precious metal, and they are sometimes richly enameled and jeweled. The gold goblet was symbolic for family and tradition. The ancient Roman calix was a drinking vessel consisting of a bowl fixed atop a stand, and was in common use at banquets. Chalices have been used since the early church. Because of Jesus' command to his disciples to "Do this in remembrance of me." (Luke 22:19), and Paul's account of the Eucharistic rite in 1 Corinthians 11:24-25, the celebration of the Eucharist became central to Christian liturgy. Naturally, the vessels used in this important act of worship were highly decorated and treated with great respect. A number of early examples of chalices have a large bowl and two handles. Over time, the size of the bowl diminished and the base became larger for better stability. Over time, official church regulations dictated the construction, blessing, and treatment of chalices. 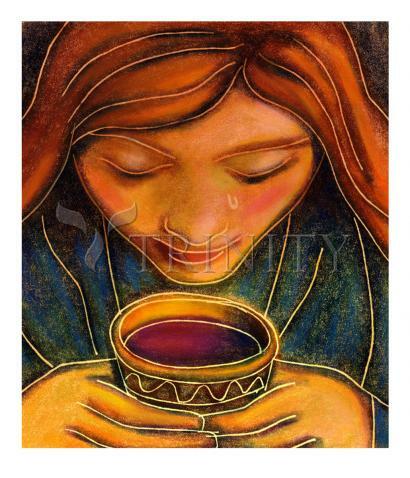 Some religious traditions still require that the chalice, at least on the inside of the cup, be made of gold.